In the 71 years that Mercury manufactured automobiles, it struggled with an identity problem. 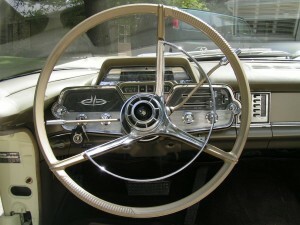 Mercurys were often identified as senior Fords or junior Lincolns. During the 1950s, however, Mercury was given its own identity with the Monterey convertible. A total of 4,426 Monterey convertibles were built in 1959. One of them, a Madeira Yellow model, was sent to the Port Motors Lincoln Mercury dealership in Manhasset, N.Y. It was there, not far from her home, that Donna Budd saw the handsome Mercury. She promptly arranged to trade her 1955 Mercury coupe for the yellow convertible. The 4,074-pound Mercury was equipped with optional extras including: automatic transmission ($189.60), power steering ($75.30), heater/defroster ($74.50), AM radio ($58.50), power brakes ($43.20), white sidewall tires ($41), safety belts ($20.60), padded dashboard ($19.20), full wheel covers ($16.60), electric clock ($14.60), windshield washer ($13.70), courtesy light group ($10.80), and backup lights ($9.50). Budd received an allowance of $1,643.45 on her trade in. The total cash delivered price of the new Mercury was $3,908.45. That left a balance owed of $2,265, which was financed and paid off at the monthly rate of $70.47 for 36 months. Budd took delivery of her new convertible on June 16, 1959, started the 312-cubic-inch V-8 engine and with 210 horsepower at her command happily drove home with 14-inch Goodyear tires supporting the car on a 126-inch wheelbase. In the mid-1960s many military men were being sent to Vietnam. One of them was Donna Budd’s son. Her grandson, Andy, was eight years old in the summer of 1967 when the family went to New York to visit his grandmother before his father went to war. It was on that visit that he took his only ride in his grandmother’s 1959 Mercury Monterey. Another decade passed and the Budd family was stationed in Norfolk, Va. 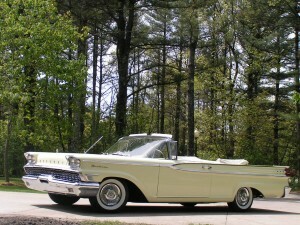 The health of Budd’s grandmother was failing, so she — and her Mercury convertible — came to live in Norfolk. That day arrived 32 years later when Budd tracked the 1959 convertible to Wisconsin Rapids, Wis. Records show that the man his father sold the car to kept it only a few months before selling it to two brothers-in-law. They took it to Wisconsin where one of the owners bought out the other. The car was then parked in a garage for 30 years. In September 2008, two other Wisconsin men, avid antique automobile collectors, purchased the Mercury. Budd informed them that the car originally was his owned by his grandmother. He made several offers to buy the Mercury, each one more outrageous than the previous one. The men had no intention of selling the incredibly original-condition car. Budd offered the men money, then more money, then even more money — plus a car. The offers were rejected. In October 2009, the two Wisconsin men and Budd attended an antique car auction in Branson, Mo. At the conclusion of the auction Budd approached the Mercury owners and sweetened his earlier offers with more cash. The men thought it over and then agreed to sell the car to Budd — only because his grandmother had owned it. From Missouri, Budd sent a truck to Wisconsin to get the Mercury and haul it home to Warrenton, Va.